What a startlingly entertaining comedy this is! Sweetly bland gay hunk Joey (Matthew Pender) decides to marry the never-seen Bobby. But, title to one side, that’s not the real story here. Joey’s Southern socialite mother Sarah Edwards is the real central character, a fantastic comic creation of the Atlanta-based playwrighting team that goes by the name “William Wyatt.” It isn’t that Sarah opposes the wedding as such — she’s glad to see her son happy — but she does have an overwhelming desire to keep up appearances, and that’s the engine that drives most of the play’s comedy. When Joey Married Bobby is a tasty vehicle for the actress playing Sarah, a well-intentioned slightly-off-her-beam snob, and the diminutive, fast-talking Tina McKissick plays the living daylights out of the part. Her firecracker performance alone is worth the cost of admission. But Sarah’s not the only comic showpiece that William Wyatt has devised. 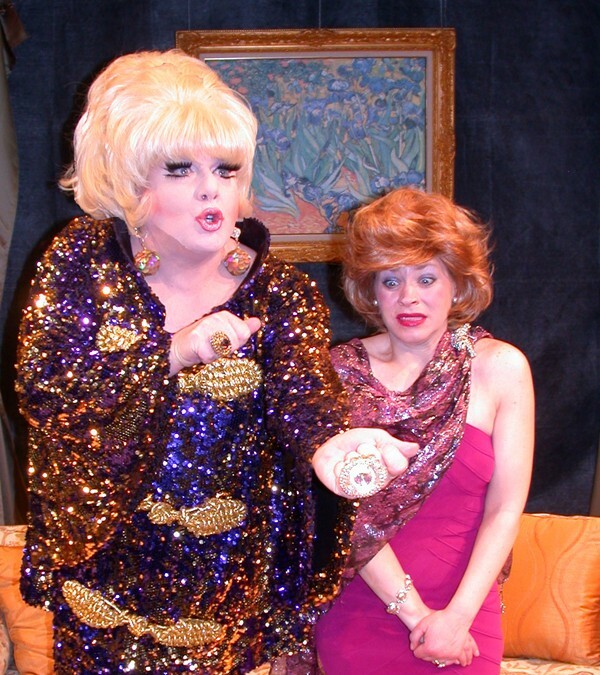 None other than legendary drag queen Lady Bunny plays the powerful but clueless Baptist Minister’s Wife, Charity Divine (interestingly enough, Charity doesn’t oppose the wedding either, mostly because she’s incredibly self-centered and flighty). Bunny’s been hamming the hell out of her song parodies for ages, and I am delighted to report that she is just as riotously funny milking Wyatt’s dialogue for every possible laugh. But even though the William Wyatt team has certainly created a satisfying comic entertainment, they haven’t created a play where all of the parts fit well, or every joke lands. There’s plenty that could, no, should be cut here, not because the play is too long (it isn’t), but because they’re laugh lines that just aren’t funny and don’t get laughs. I recommend that the guys behind When Joey Married Bobby go on what the great director Jack O’Brien calls a “clam hunt”. During the show keep a script in hand and make a mark next to what gets a laugh; the bigger the laugh the bigger the mark. Repeat for several performances to counteract odd audiences. If something you wrote for a laugh has only tiny marks next to it, ditch the sucker. Then, When Joey Married Bobby will not only be a lot of fun (which it already is) it’ll also be airtight.